The Maine Association of School Business Officials is an association comprised of Business Managers, Finance Directors, Operations Managers, Human Resources, Payroll Specialists, Accounts Receivables and Payables Specialists, as well as Vendors that specialize in School-Related Services and Products. Our membership is available to Public, Private and Charter School employees that work in the Business Offices and Finance Related fields in their schools and we welcome Companies that provide products and services to schools as well. 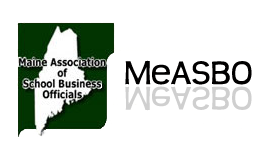 Of the 250 School Administrative Units in Maine, 129 SAU's are represented in MeASBO. We have a strong focus on professional development and networking. We hold 4-5 business meetings a year and bring in speakers for motivation as well as training and updates on school finance in Maine. We are an affiliate of ASBO International and partner with New Hampshire ASBO and Vermont ASBO for an Annual Tri-State Conference each May.